A Meter Maid Mistreats A Homeless War Veteran. Now Keep Your Eyes On The Kid Beside Him! WOW! Going through life has plenty of ups and downs to keep us both entertained and on our toes, but sometimes life just deals a hand that you literally can’t play. Many returning vets with issues beyond the scope of physical pains end up homeless on the streets with no idea how to function in the civilian world after what they’ve been through; and no one blames them until it actually comes time to step up and help. This social experiment conducted by MoeAndET was designed to see how the populous reacts to a homeless kid versus a homeless adult, with the homeless kid actually being their little brother and the homeless adult being an out-of-work veteran. The results are staggering; just how much abuse are the homeless supposed to take when even the random people on the streets abuse them? 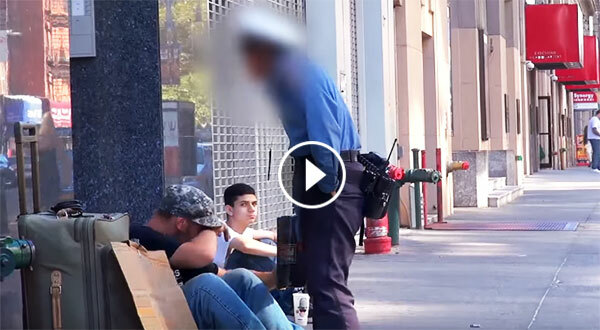 A police officer even began harassing him simply for asking for some spare change – after she’d given some to the kid! Being homeless shouldn’t be a social death sentence, it should be something that every first world country should attempt to eradicate. Humans are by far the most creative beings on the planet and it’s high time we used that creativity to fix a problem that never should have existed in the first place.